Cookbook #24: Good Cooking made Easy. Spry, the flavor saver. Lever Brothers Company, Cambridge, Massachusetts, 1942. 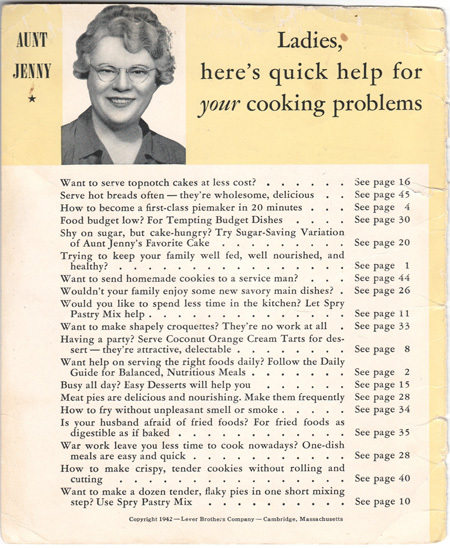 Featuring advice and recipes from Aunt Jenny. The time is 1942. 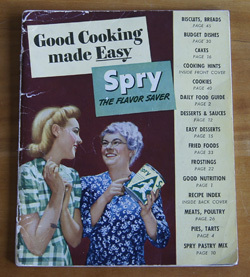 The cookbook is Good Cooking made Easy, featuring Spry, a vegetable shortening. So you have a real job to do in your country’s defense . . . to see that your family gets good food and plenty of it . . . to choose the right foods . . . prepare them so that they will be both appetizing and delicious. It is not enough for food to be wholesome, nutritious, well-balanced . . . food must also look good, taste good. That is where all you good cooks step in and take over. You know that reliable recipes are important in helping you turn out dishes that are attractive, good to eat. You rely upon pure, wholesome ingredients for making good, nourishing foods. Healthful breads and biscuits . . . hearty main-dish casseroles . . . light, delicate cakes . . . tender, flaky pies – these are some of the stand-bys that will help you serve satisfying, balanced meals. To keep the body in good running order, include each of these nutrients in the diet, daily. Ah yes. I do need to eat vegetable shortening to help furnish bodily warmth. One cup of Spry will furnish all the calories I need in a day! What a refreshing idea! I like being told to eat pies and cakes. I’m tired of the current litany pushing fresh, local, organic fruits and vegetables. Of course, something is a bit “off” with this cook-booklet. But it’s not only the nutrition advice, it’s the comments throughout the booklet. Here are scans of several pages from the booklet. Note my mother’s “Good” on this recipe. Also note the photos of perfect cakes and muffins. “Even children can eat them?? ?” This is just such a strange statement. 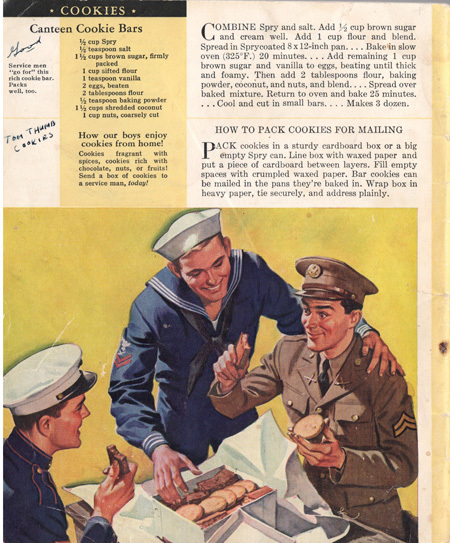 “Pack cookies in a sturdy cardboard box or a big empty Spry can.” Be sure to “address plainly.” Isn’t the illustration great? This is the original source of my mother’s Tom Thumb Bar cookie recipe. I turned to web searches to find out more about the origins of this booklet. 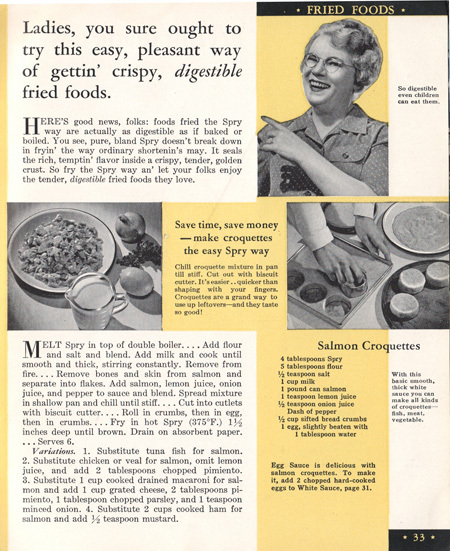 In 1936, Lever Brothers began producing Spry, a solid vegetable shortening. 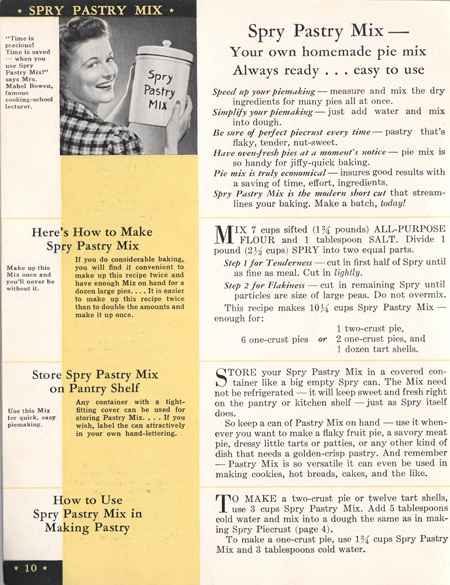 Spry competed with Procter and Gamble’s Crisco®. Lever Brothers waged an ad campaign, including an advertising character named “Aunt Jenny”. Aunt Jenny (Edith Spencer in real life) was the host of a radio show called Aunt Jenny’s Real Life Stories. This show ran for two decades, beginning in 1937. As the narrator, Aunt Jenny told a person’s story over several days, in a soap opera fashion. Aunt Jenny included in each episode a recipe for an entree or baked good made with Spry, and she lauded the merits of Spry from her personage as a wise and friendly older woman. 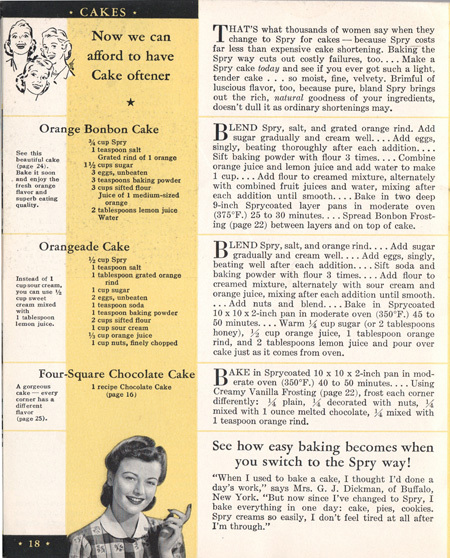 Several printed booklets of Spry recipes were published with Aunt Jenny’s comments included. This advertising campaign greatly improved Spry’s percentage of the vegetable shortening market. By the 1970s Spry was no longer available in the US. 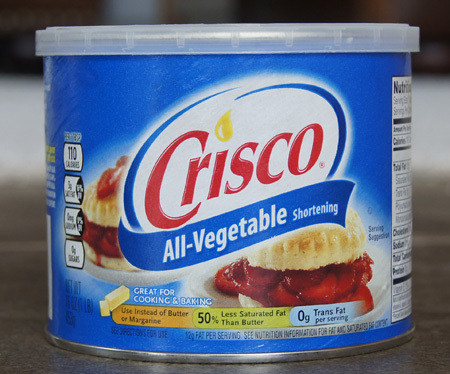 I am old enough to remember Spry, although Crisco® was what we had in our kitchen when I was growing up. Now, back to business. What recipe shall I cook from this booklet? It has recipes for everything from main dishes to breads to desserts. Gosh, 1942! My mother was a new bride then and only 26 years old! She marked several recipes. One of those recipes – Canteen Cookie Bars – made it into her repertoire as “Tom Thumb Bars”; I remember these well from childhood. I decide to try Spicy Oat Cookies. 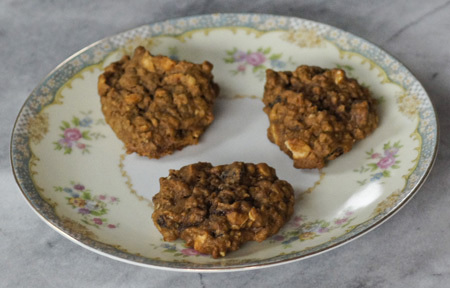 My mother wrote a “Good” next to the recipe, and they have a modicum of healthiness by including oatmeal, peanuts, and raisins. 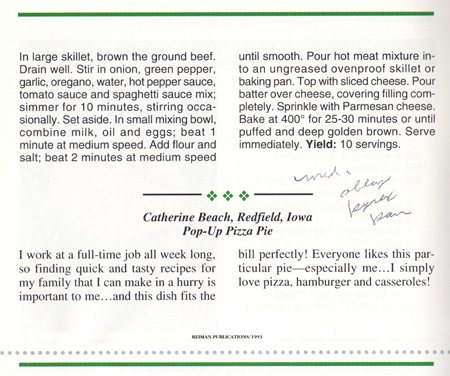 Here’s a scan of the original recipe. Note the food stains! I’ll make them almost like the recipe. I’ll use Crisco® instead of Spry, and I’ll cut the salt in half. I think that molasses is included because sugar was rationed during World War II. Mix the vegetable shortening with the salt and cinnamon, then add the sugar and molasses and beat until light and fluffy. (Use a stand mixer.) Add the egg and beat well. Combine the baking soda with the flour, and with the mixer on low, add to the creamed mixture. Beat only until it’s all mixed in. Add milk, oatmeal, peanuts, and raisins and mix on low until combined. 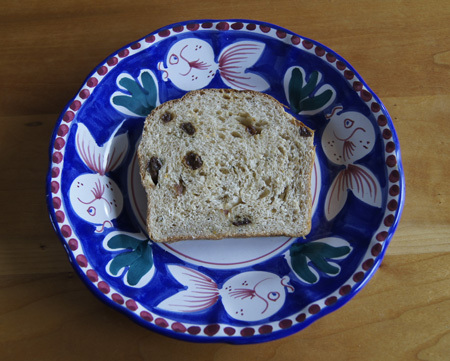 Drop dough from a teaspoon on a parchment-lined baking sheet. (You can use greased cookie sheets if you prefer.) Bake at 350˚ for 12-14 minutes. Makes about 3 1/2 dozen. These are excellent cookies! If they last long enough, we’ll pack them along with us on our next hike – they make great little energy bar-cookies. 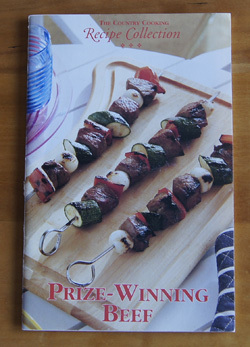 Cookbook #23: Prize-Winning Beef. The Country Cooking Recipe Collection; Reiman Publications, Mary Beth Jung, editor, Greendale WI, 1993. This little booklet of 32 recipes was part of my mother’s collection. Most of the recipes sound okay, but they are not very innovative. 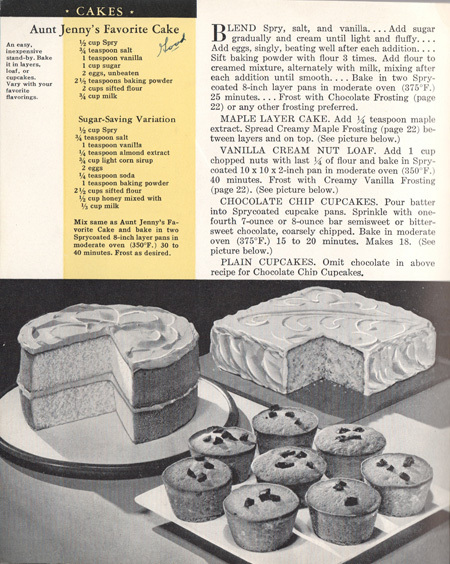 The recipes seem to be more from the 1950s or 60s than the 1990s. There are recipes for country ribs, beef meatballs, nachos, flank steak, southwest stew, chile, and the like; I already have my own ways of cooking most of these. A couple of the recipes are calorie-laden with the addition of pastry. 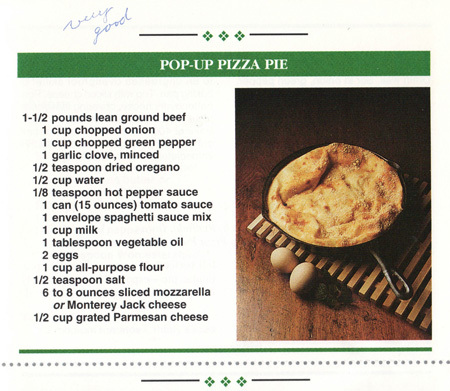 My mother marked one recipe: “Pop-up Pizza Pie”. She wrote that it was “very good”, so I decided to try that recipe for this 250 Cookbooks blog. Last weekend I tried another recipe from this booklet; it was for barbecue beef and it turned out well – I plan to add it to my personal recipe collection and might share it here eventually. But I am going to recycle the booklet itself. It has served its purpose. The original recipe, below, supposedly serves 10 people. I will cut the recipe in half for the two of us. I expect I will have leftovers! 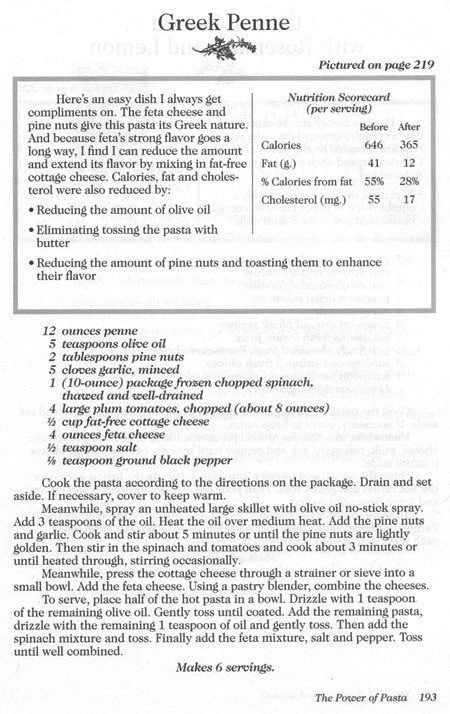 Note that the original recipe calls for “one envelope spaghetti sauce mix”. This means one of those small seasoning packets that once were so popular. I don’t keep any of these in my pantry. Since I want the dish to taste as close as possible to the original recipe, I searched online and found that several websites have posted recipes for spaghetti sauce mix. Most of these recipes include cornstarch, sugar, herbs and spices. I checked the labels of packaged spaghetti sauce mix in the supermarket and they too include cornstarch, sugar, and spices – I think I am on the right track. But which spice recipe to follow? Then, just in time, one of the cooking blogs that I follow, Lynn’s Kitchen Adventures, posted a recipe for “Homemade Spaghetti Seasoning Mix“. Yay! I made up a batch of spice mix following her recipe. I suggest you do too. It’s an excellent seasoning mix that puts a spaghetti sauce on the table in a flash. Brown the ground beef and drain well. Stir in onion, green pepper, garlic, oregano, water, hot pepper sauce, tomato sauce and spaghetti sauce mix; simmer for 10 minutes, stirring occasionally. In a small bowl, combine milk, oil, and eggs; beat 1 minute at medium speed. Add flour and salt; beat 2 minutes at medium speed. Put the hot meat mixture in an oven-proof pan or casserole. A 9-inch round pan or an 8×8-inch square pan works well. Top with the mozzarella cheese. Pour the batter over the cheese, covering the filling completely. Sprinkle with Parmesan cheese. Bake uncovered at 400˚ for 25 -30 minutes or until puffed and deep golden brown. Serve immediately. Well. I was wrong, we hardly had any leftovers! We started eating and I said “I like this!” and my husband said “very good!” Hey, that’s what my mother wrote on the recipe! I went back for seconds and wanted more. I will definitely make it again. This is a good “comfort food” entree. 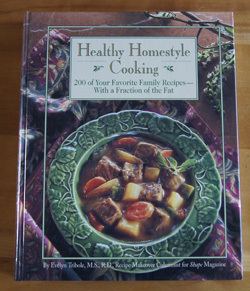 Cookbook #22: Healthy Homestyle Cooking. Evelyn Tribole, Rodale Press, Emmaus, Pennsylvania, 1994. This is another of my low-calorie cookbooks. Several pages are neatly dog-eared, noting recipes that still look interesting to me today, although I’ve never tried them. A page with a recipe for falafel is marked with a newspaper-clipped recipe for “Hummus Patties”. I love falafel (made from garbanzos), but they are usually fried in a lot of oil and so I avoid them because of calories. Both recipes I just re-found call for cooking in a minimum amount of oil in a non-stick pan. A great idea. This is a useful cookbook, and I ask myself: Why is it that I haven’t I used it in ages? I think I know what happens. I buy a cookbook and read it and try recipes for a few weeks or months, then the cookbook gets covered with papers and forgotten and eventually re-shelved. Doing this 250 Cookbooks blog is great for me, personally, because the project is forcing me to re-discover books that have a lot of good ideas. The good ideas in this book are lower-calorie versions of many common home-cooked meals: pot pies, lasagna, chicken divan, enchiladas, carrot cake, brownies, and lots more. Each recipe has a personal note and pointers on how to reduce calories. And as a bonus, the book is nicely illustrated with many full-page color photos. I’m going to try “Greek Penne”. It’s one of the pages that I had dog-eared. This is a vegetarian dish, and I decided to try it on a night when I just have me to cook for. 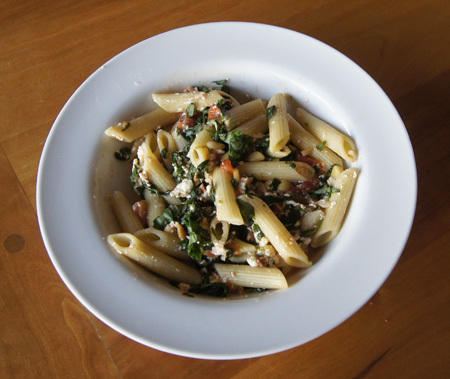 I’m looking forward to this easy-to-prepare dish of penne, tomatoes, spinach, pine nuts, and feta. It’s interesting that the tomatoes are just barely cooked: I just took a cooking class at Escoffier Boulder where we made a dish including barely-cooked tomatoes called “Concasse”. The original recipe is below. I plan to change the recipe a little: I’ll peel and seed the tomatoes and use fresh spinach, and add a little fresh basil. This recipe serves about 6 people, depending on appetites. Cook the pasta; drain and set aside. Press the cottage cheese through a strainer into a small bowl. Rap the strainer against the top of the bowl to get all the cottage cheese into the bowl. You could also put the cottage in a small blender, but the texture is kind of nice if you use a strainer. 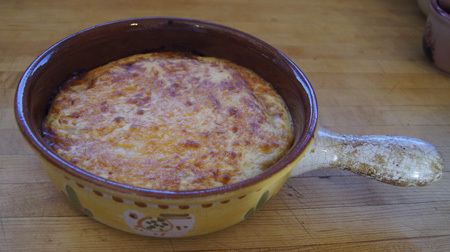 Add the feta cheese to the cottage cheese and mash up with a fork (or pastry blender). Set aside. Cook and stir the pine nuts and garlic in a small amount of olive oil in a pan large enough to hold the entire finished dish. Cook until the pine nuts are lightly golden – watch carefully as it doesn’t take very long. Then stir in the spinach and tomatoes and cook for about 5 minutes, until heated through. 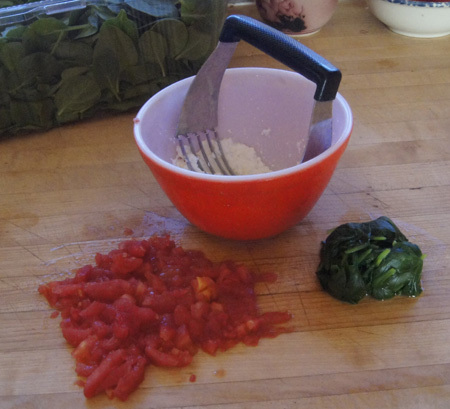 The pasta is probably cool by now, so add it to the tomato-spinach mixture and heat and mix gently until it is serving temperature. Add olive oil and salt and pepper to taste. Finally, add the feta cheese mixture and gently mix. Serve with a little chopped fresh basil, if you wish. This was very good, and I’ll make it again. My following comments concern only the calorie-cutting suggestions. The author states that the original recipe had 646 calories per serving, the new version has 365 calories. The calorie value of the original recipe must include a huge amount of butter/oil per serving. The best cutting of calories comes from not tossing the pasta with butter – duh. I think the nit-picking of using non-fat cottage cheese to cut the feta is a little obsessive. Feta cheese: 4 ounces of feta has 320 calories, 200 of which are from fat. Per serving, that’s about 55 calories (33 from fat). If you don’t care about an extra few calories per serving, use a little more feta and skip the cottage cheese, because it isn’t going to change the overall calorie content very much. Pine nuts have a lot of calories! But just a few go a long way. Pine nuts: 2 tablespoons weigh 1/2 ounce, and according to Nutrient Facts this amount has 90 calories (mostly fat-calories). Divided amongst 6 people, that’s only 15 calories per serving. I’d say, add more pine nuts if you want. 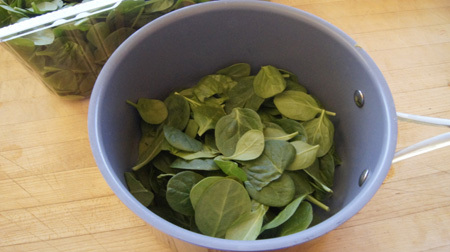 Of course, it’s easier to use frozen spinach, but the fresh spinach tasted really good. Cookbook #21: Sunset Cook Book of Breads. By the Editors of Sunset Books and Sunset Magazine, Lane Publishing Co., Menlo Park, California, 1978. I opened this book and immediately knew I’d keep it. I found many recipes I wanted to try. It was published 35 years ago, so that’s pretty amazing. Why haven’t I marked it up and tried a bunch of these recipes? Oh, I see. I gave this cookbook to my mother Christmas 1979, she wrote a note to that effect on the inside front cover. She was more interested in baking pies and cookies and casseroles than breads. I was always the one with a passion for yeast breads. I organize all the recipes that I clip from magazines, newspapers, and other sources by entering them in a database I began in the 1990s. (Over 800 entries!) 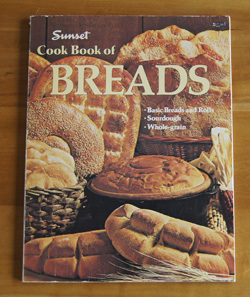 Thinking that several recipes in this Sunset Cook Book of Breads look familiar, I checked that database. Sure enough, ten of this cookbook’s recipes are referenced there. So before I gave the cookbook to my mother back in 1979, I must have copied several pages of recipes to try, and I still have those copies today. The bread recipe I will bake this week is “Spicy Zucchini Wheat Bread”. It is not one of the recipes I copied all those years ago, but it appeals to me now. 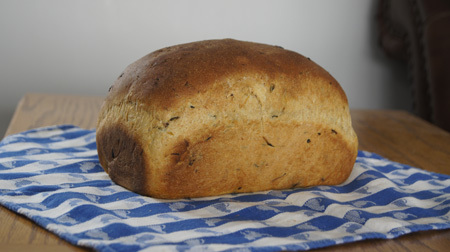 I like incorporating vegetables in breads; the zucchini will add fiber and nutrients and keep the loaf moist. I like the inclusion of whole wheat four and wheat germ too. Cardamom is the spice: Wow! Cardamom usually pops up in ethnic cuisines, not American bread cookbooks from the 70s. I’m tempted to substitute with cinnamon, but I’ll stay with the cardamom. Live dangerously. I will use my bread machine and write my own version of the recipe incorporating my changes. 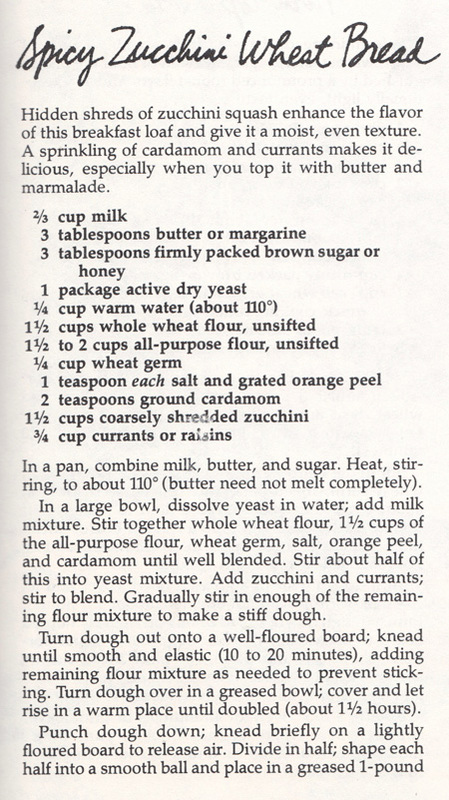 If you don’t have a bread machine, follow the original version for mixing and rising. Combine all ingredients in the bread machine and set to the dough cycle. (The dough cycle should mix and rise the dough.) Check the dough during the first few minutes of mixing to make sure that the dough is coming together into ball of dough; add a little more flour or water as necessary. Take the risen dough out of the bread machine. 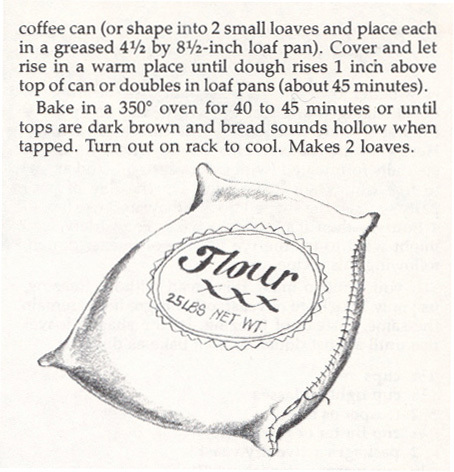 Form into 2 loaves and place in lightly greased 4 1/2 x 8 1/2-inch loaf pans. Let rise until the dough is 1/2-1 inch above the rims of the pans. Bake at 375˚ for 30 minutes. This bread turned out great, and I will definitely make it again. I like it best toasted with a little light cream cheese or jam or apple butter.